Fishing in Scotland is wonderful, but fishing while touring Scotland’s North Coast 500 is something very special indeed. You have to make an effort to reach the far north west of Scotland. You are best to add a couple of days to the start and finish of your trip, just to allow for the driving. The choice of hotels is more limited. However, the rewards are exceptional. Most fishermen visiting Scotland arrive into Edinburgh and head straight for one of the four best salmon rivers, the Tweed, Tay, Dee and Spey. These are all great rivers in lovely settings, but all flow from central Scotland to the east coast. They are longer rivers and have huge catchment areas, normally ensuring “fishable” conditions, whatever the prevailing weather. The west coast rivers, particularly in the north, are short, sometimes less accessible and normally reliant on rainfall to induce fresh Atlantic salmon to enter the systems. In the south, central and eastern parts of Scotland, the best brown trout fishing is in the same four great salmon rivers, plus numerous other, smaller rivers. In the north west the brown trout fishing is all about accessing the remote Highland lochs. I recently had the opportunity to accompany returning clients (friends), on a trip taking in the route from Oban to Orkney, and then back down the east coast, back to Edinburgh. As it had been a couple of years since my last sojourn to the far north west, I was excited to revisit this unique landscape. I began my trip with a day of pike fishing in the reedy waters by the ruin of Kilchurn Castle on Loch Awe. My guide and fishing companion Keith, is a renowned expert on this beautiful loch and he regularly guides for River & Green clients. We had a great day with 3 pike to 25lbs on drifted dead baits and 2 smaller fish on spinners. That night I stayed at Barcaldine Castle, one of our most popular B&B accommodations. Steeped in history, this magnificent place is as evocative as it is comfortable. The next day I headed north on the NC500 to Lochinver. I had set the day aside to relax and simply enjoy the changing scenery, stopping numerous times along the way to photograph majestic Glen Coe, Loch Cluanie, Loch Duich and Loch Broom. A 5 hour drive was done in 8 hours, with further stops for sighting red deer stags on the mountains by Attadale and a lunch of fresh crab and langoustine in the quaint port of Ullapool. 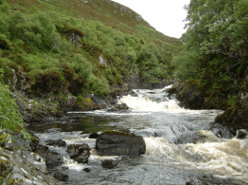 It had been a 30 year wait to fish the famous river Kirkaig the following day. This amazing river flows rapidly through rocky gorge and ancient Highland forest. A small river which holds huge salmon, the river offers a sequence of small, deep pools, requiring innovative and accurate casting. Although a salmon was hooked and lost just before lunchtime, sadly no fish was caught on the day. That night I stayed at the Scourie Hotel, a mecca for traditional Highland loch fishers. The hotel was taken under new ownership two years ago and has been completely refurbished. Today, the place retains its historic charm, but presents it with style and comfort. Amazingly, the proprietors control the fishing on over 300 lochs! Since Victorian times, the hotel has operated a system of daily allocating lochs to fishers and recording their catches. It is a joy to sit by the fire in the supremely comfortable lounge and look through the old catch return books, while sipping on a rare malt whisky. Here, 90% of the guests are fishers and the conviviality of the atmosphere is fabulous. Early the next morning, after a superb Highland breakfast, we set out to our allocated loch. To reach Loch Mhuirt, required a 20 minute hike, up and up over rough, sometimes boggy, heather clad hillside. With legs aching and heart pumping, it was both a relief and a joy to look down on the waters of the loch. Words cannot do justice to the awe inspiring view. The remote setting is simply awesome. Thirty two fish were caught that day. All fought with a ferocity which belied their modest size, the best weighing just under 2lbs. But size really does not matter in this case. It is the emotions stirred by simply being in this amazing place, for a moment in time being a part of this most ancient landscape. As I drove south the following day, the wild and rugged landscape gently gave way to something less dramatic. You don’t so much “leave” the true Highlands, instead you make a subtle transition to surroundings more familiar. As mountains become hills and heather is replaced by trees, you have a poignant sense of leaving behind an ancient solitude and re-joining the modern community. If you would like to experience the beauty of Scotland’s North Coast 500 then contact us today and we would be delighted to create a bespoke itinerary for you.